If humans are ever to get to like and live with robots we need to understand each other. One of the ways that people let others know how they are feeling is through the expressions on their faces. A smile or a frown on someone’s face tells us something about how they are feeling and how they are likely to react. Some scientists think it might be possible for robots to express feelings this way too, but understanding how a robot can usefully express its ‘emotions’ (what its internal computer program is processing and planning to do next), is still in its infancy. A group of researchers in Poland, at Wroclaw University of Technology, have come up with a clever new design for a robot head that could help a computer show its feelings. It’s inspired by the Teenage Mutant Ninja Turtles cartoon and movie series. 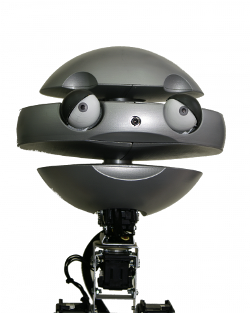 Their turtle-inspired robotic head called EMYS, which stands for EMotive headY System is cleverly also the name of a European pond turtle, Emys orbicularis. Taking his inspiration from cartoons, the project’s principal ‘head’ designer Jan Kedzierski created a mechanical marvel that can convey a whole range of different emotions by tilting a pair of movable discs, one of which contains highly flexible eyes and eyebrows. The lower disc imitates the movements of the human lower jaw, while the upper disk can mimic raising the eyebrows and wrinkling the forehead. There are eyelids and eyebrows linked to each eye. Have a look at your face in the mirror, then try pulling some expressions like sadness and anger. In particular look at what these do to your eyes. In the robot, as in humans, the eyelids can move to cover the eye. This helps in the expression of emotions like sadness or anger, as your mirror experiment probably showed. But then things get freaky and fun. Following the best traditions of cartoons, when EMYS is ‘surprised’ the robot’s eyes can shoot out to a distance of more than 10 centimetres! This well-known ‘eyes out on stalks’ cartoon technique, which deliberately over-exaggerates how people’s eyes widen and stare when they are startled, is something we instinctively understand even though our eyes don’t really do this. It makes use of the fact that cartoons take the real world to extremes, and audiences understand and are entertained by this sort of comical exaggeration. In fact it’s been shown that people are faster at recognising cartoons of people than recognising the un- exaggerated original. The mechanical internals of EMYS consist of lightweight aluminium, while the covering external elements, such as the eyes and discs, are made of lightweight plastic using 3D rapid prototyping technology. This technology allows a design on the computer to be ‘printed’ in plastic in three dimensions. The design in the computer is first converted into a stack of thin slices. Each slice of the design, from the bottom up, individually oozes out of a printer and on to the slice underneath, so layer-by-layer the design in the computer becomes a plastic reality, ready for use. A ‘gesture generator’ computer program controls the way the head behaves. Expressions like ‘sad’ and ‘surprised’ are broken down into a series of simple commands to the high-speed motors, moving the various lightweight parts of the face. 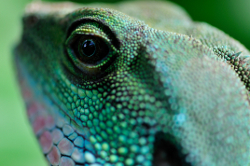 In this way EMYS can behave in an amazingly fluid way – its eyes can ‘blink’, its neck can turn to follow a person’s face or look around. EMYS can even shake or nod its head. EMYS is being used on the Polish group’s social robot FLASH (FLexible Autonomous Social Helper) and also with other robot bodies as part of the LIREC project (www.lirec.eu). This big project explores the question of how robot companions could interact with humans, and helps find ways for robots to usefully show their ‘emotions’. In this issue, there is a chance for you to program an EMYS-like robot. Follow the instructions on the Emotion Machine in the centre of the magazine and build your own EMYS. By selecting a series of different commands in the Emotion Engine boxes, the expression on EMYS’s face will change. How many different expressions can you create? What are the instructions you need to send to the face for a particular expression? What emotion do you think that expression looks like – how would you name it? What would you expect the robot to be ‘feeling’ if it pulled that face? Why not draw your own sliders, with different eye shapes, mouth shapes and so on. Explore and experiment! That’s what computer scientists do.